Apple has released the first public beta version of iOS 8.4 to those registered to participate in the iOS Public Beta program. 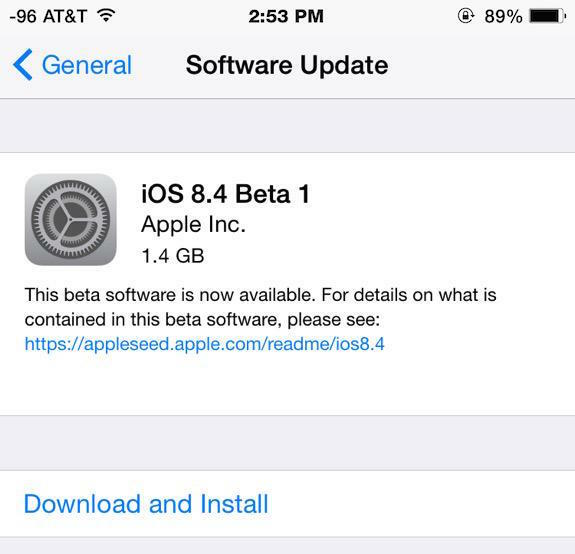 Additionally, the same build of 12H4086d has been released to registered developers labeled as iOS 8.4 beta 2. 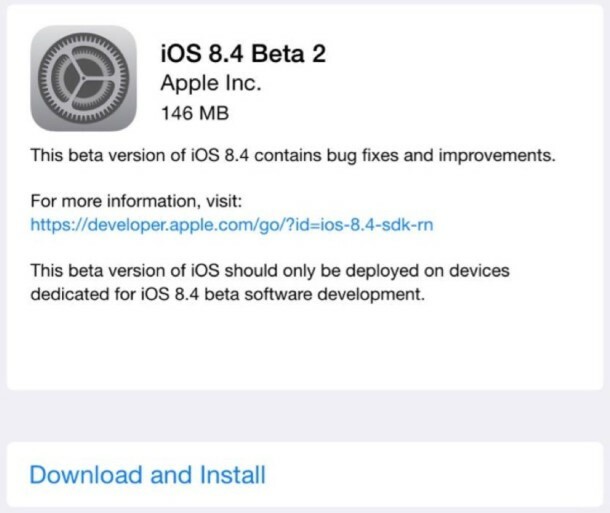 Public beta users and registered developers can find the iOS 8.4 beta download available through the Software Update mechanism on their iPhone, iPad, or iPod touch. Registered Developers can also download iPSW directly from the iOS dev center website. iOS 8.4 will surely include bug fixes and stability improvements, but the most notable changes thus far pertain to the Music app, which has been redesigned. Users who are interested in learning more about the specific changes seen thus far in iOS 8.4 beta 2 can visit 9to5mac for screen shots and further specifics. Separately, Xcode 6.4 beta 2 is also available for developers to download, and Mac users in the developer and public beta programs will find a new build of OS X 10.10.4 available. Finally, aside from the beta focus of todays updates, a separate Apple TV update has arrived which includes the addition of an NBC Sports channel. 8.3 seems to work fine in my 5c. I’ve had no issues that I’ve noticed. Can someone with 8.4 beta 2 tell me, that if i change volume during playback via earphones (or buttons on device), does the screen light up even when you have phone in you pocket? I think that was not an issue on iOS6 (I never used iOS7), but unpleasantly suprised me on iOS8. The iPhone screen lights up only when you adjust the volume higher than a certain predefined level. In my case there is also an onscreen text “very loud” or sort of. You can verify this by setting the volume very low and you’ll see that the display won’t lighten up untill you reach this preset volume setting. How do I get on the Beta iOS program? I have been a member of the OS X beta program since day one and have never seen an option to join in on or download the iOS betas. 8.4 beta 1 has been a complete disaster on my 5S iPhone… After loading the beta, the iPhone turned into a virtual pocket heater… Turning it off completely is the only way to cool it off… Took it into the Genius Bar & they reset the firmware,but that has not worked… The battery took a huge hit… Going from lasting all day to being gone by mid afternoon… After the firmware update, my iCloud backup started downloading my data, but it froze when it got to the Pictures app & it been that way for 3 days… I have erased my phone software several times but the iCloud back continues to freeze when it reaches the Photo app… So now I have a hot phone, half day battery & a frozen iCloud app…..
You should restore back to iOS 8.3 right away, I do not recommend running beta software from Apple. The so called “final” software versions of iOS and OS X are basically still beta as is, so running a designated beta is like running an alpha build that nobody has done any testing on, they throw it out there to whoever wants to run it and the result is usually not positive. This usually falls into the developer hands, but now that the Public Beta program exists (bad idea, they ignore bug reports anyway), people like yourself are getting impacted by the cruddy software experience. Downgrade to a stable final build (iOS 8.3) and opt-out of public beta, that’s my advice! I am trying to downgrade to iOS 8.3, but if i try to “restore” from my backup (which was made with iCloud under iOS 8.4) i get the message that i need to install iOS 8.4 to restore… So this means i lost all my messages, call history, etc? Do you know a work around? Did you get to solve this? I’m having the same problem right now. Not even remotely accurate, but hey this is this internet. Betas are not for people who don’t know what they’re doing. 8.3 introduced a bug with connectivity to external Bluetooth GPS receivers. So the £100 Apple Certified unit I bought doesn’t work any longer. It’s not the only ‘Apple Certified’ make/model that no longer works, they all stopped apparently. But of course it’s not Apples change that caused the problem, no, it’s every one else’s fault. Apple keep introducing these issues but seem incapable of fixing them and doesn’t listen to their customers either. For me the only problem is having to switch on show all music to see any of my music and stay out of airplane mode. Other than that I’ve noticed significant speed enhancements on my iPad Air first gen and my iPhone 6 plus. Neither with heating issues, battery issues, etc. So far, my experience with the public betas has been pretty smooth. However, iOS 8.4 has brought a few issues to the table. The first, like many others have said, is you have to enable “show all music” for any music to show up in the music app. This is annoying because I only want to see what music I have on my phone, and not everything I have ever purchased. Another major issue is battery life: on my iPhone 5 64gb I am almost down to 5% by the end of the day, while on 8.3 I was down to 40%.